Of late, the global licorice extracts market is witnessing a stable progress, thanks to the growing demand for pharmaceutical products, herbal medicines, and various other health products among people across the world. The increasing uptake of natural ingredients in medical supplements, together with the rising inclination of consumers towards sugar-free products, boosted by the upswing in the consumer consciousness towards health and fitness, is fueling the demand for licorice extracts, reflecting greatly on this market. Currently, the market players are focusing aggressively on research and development activities to develop new products in order to satisfy the swelling demand for sugar-free products, as the rising prevalence of diabetes and obesity has increased the concerns of consumers over the high intake of sugar. This, as a result, is expected to benefit the sales of licorice extracts in the years to come. Apart from this, the opportunities generated by the advent of herbal medicines in developed regions are also projected to reflect greatly on the market for licorice extracts, globally. The overall opportunity in this market, which stood at US$1.70 bn in 2016, is anticipated to reach US$2.3 bn by 2025, expanding at a CAGR of 4.0% between 2017 and 2025. Geographically, the worldwide market for licorice extracts has been categorized into the Middle East and Africa, Europe, North America, Latin America, and Asia Pacific. Driven by China, India, and Japan, Asia Pacific dominated the global market in 2016 with a share of more than 32%. Analysts expect this regional market to retain its position over the forthcoming years. Europe, which held the second position in the global licorice extracts market in 2016, is likely to continue in the same position in the near future. The increasing demand for low-calorie foods, owing to rising consumer preference for a healthier lifestyle is expected to boost this regional market. The U.K., Germany, France, Italy, and the Rest of Europe have been driving the Europe market for licorice extracts, among which, Germany has taken the lead on the ground of the increasing demand of natural ingredients into various medical supplements. Amongst other regional markets, North America is anticipated to witness a prominent rise in the years to come, thanks to the new opportunities being created by the growing usage of herbal medicines. The licorice extracts markets in the Middle East and Africa and Latin America are also expected to experience healthy growth in their shares over the next few years, thanks to the continuous research and development in this field. Pharmaceuticals, tobacco, and food and beverages are the key application areas for licorice extracts. The demand for these extracts has been greater in the food and beverages segment and is projected to remain doing so over the forthcoming years. However, the tobacco segment is likely to report a high-paced demand for licorice extracts in the near future due to the increasing usage of these extracts at a sweetening agent. The augmenting popularity of flavored tobacco products is also expected to increase the application of these extracts in this segment over the years to come. Norevo GmbH, F&C Licorice Ltd., Mafco Worldwide LLC, Zagros Licorice Co., VPL Chemicals PVT Ltd., SepidanOsareh Co., ASEH Licorice MFG & Exp. 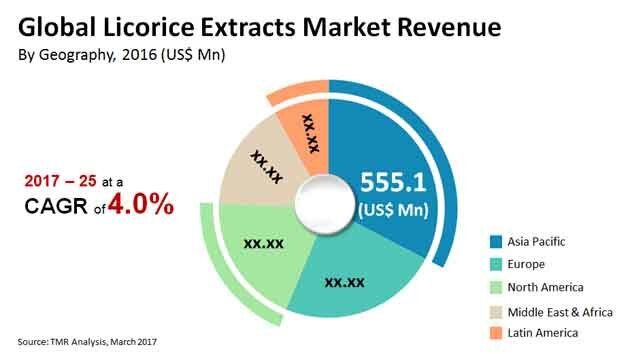 Co., Maruzen Pharmaceuticals Co. Ltd., Zelang Group, and Ransom Naturals Ltd. are the key players operating in the global licorice extracts market. Licorice is the root of the licorice (glycyrrhiza glabra) plant from which a sweet flavor is extracted and used in various industries as a sweetening agent. The root is principally used in making the extract, while the hard woody plant is pulped and boiled to further refine the content. In addition, it also offers various health benefits by acting as an antiviral, anti-inflammatory, antimicrobial, and hepato-protective agent. Licorice extracts find application in tobacco, food items, beverages, herbal medicines, pharmaceutical industry, and a variety of skin care products. The global market for licorice extracts is expected to expand at a considerable rate in the future owing to an increased demand for them. Herbal medicine is a key health care option adopted globally due to its organic nature, lack of side-effects, and limited use of synthetic chemicals. With increased demand for herbal medicine all over the globe, natural ingredients in medicines are witnessing a rise in demand. In 2013, WHO developed and launched the ‘WHO Traditional Medicine Strategy 2014–2023’ which emphasized on the integration of complementary and traditional medicine to encourage universal health care and ensure the safety, quality, and effectiveness of herbal medicine. Therefore, natural ingredients in medicines are propelling the market in a positive direction. Additionally, demand for natural low-calorie sweeteners is rising at a rapid rate globally owing to multiple health disorders including obesity and cholesterol issues which have resulted in a decline in the use of sugar-containing products. This drives the global licorice extracts market positively, as they are a natural sweetener used in the food & beverages industry on a large scale. However, synthetic sweeteners are still used in higher quantities than natural sweeteners in all application industries. The food & beverages sector employs the former extensively as they are cost-effective and easy to use. Usage of natural sweeteners is still limited, restraining the overall growth of licorice extracts globally. Developing nations in Asia and the Middle East have always used herbal and natural medicines since pre-historic times. With rising knowledge about their benefits and lack of production capacity in developed countries of North America and Europe, these markets offer huge opportunities to the global licorice extracts market. North America imports a major portion of the product. Global licorice extract market is segmented on the basis of product form, type, and application. The global licorice extract market is segmented into three types of form- powder, semi fluid/paste and block. Powder licorice is a free flowing yellow-brown powder with a characteristic fragrance with a well-balanced, mild licorice flavor with detectable sweetness. Semi-fluid/paste licorice is a concentrated solution of licorice extract with a dark brown appearance and high viscosity. Block licorice is a solid mass of licorice which has a strong sweet note of licorice. In terms of type the market is segmented by pharmaceutical grade, food grade and feed grade. Licorice extracts has multiple medicinal properties in them. They help curing a large number of diseases such as hives, bronchitis, indigestion, lyme disease, genital warts and chronic fatigue among others. Licorice contains glycyrrhizin which is sweet in nature and is thus used as a natural sweetener which is used as a substitute of regular table sugar. Additionally, feed grade licorice when added to animal and fish feed has boosted growth performance and improves immune response, and improved biochemical reactions. In terms of application the market is segmented by pharmaceutical, tobacco, food and beverage and others. Licorice extract find huge application in the pharmaceutical industry owing to its antiviral, anti-inflammatory, antibacterial, antioxidant, antispasmodic and antidepressant, expectorant and demulcent property. Licorice extract is mostly used as flavoring agent in tobacco and its acts as a natural sweetener to tobacco products. Licorice extract is used as a sweetening and flavoring agent in the food & confectionery industry and is used in large quantities in making sweets and candies. It is also used in the manufacture of mint and menthol candies. Other applications of licorice include use in skin care, personal care and cosmetics and animal feed. In order to get a better understanding of the global licorice extract market, a key trends analysis has been included for all the segments. In addition, the market players in the licorice extract market have also been profiled. The leading players in the market include Norevo GmbH, Mafco Worldwide LLC., F&C Licorice Ltd., Zagros Licorice Co, SepidanOsareh Co, VPL Chemicals PVT Ltd., ASEH Licorice MFG &Exp. Co., Zelang Group, Maruzen Pharmaceuticals Co. Ltd., and Ransom Naturals Ltd.